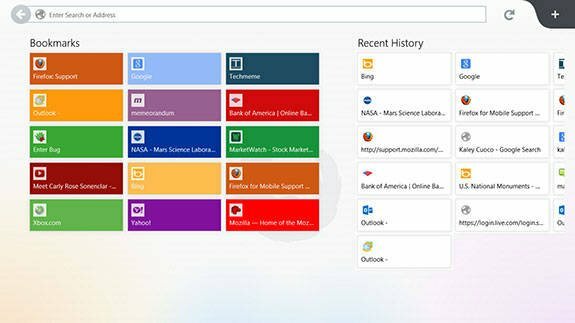 The Mozilla Foundation has made available a preview release of a version of its Firefox browser that has been re-engineered to run as both a desktop application and a Windows Store app for Windows 8's new, fondleslab-friendly Start Screen. So far, the touch-enabled version of the browser can only be downloaded from Mozilla's nightly builds, meaning the code is still very raw. In fact, it installs itself as an application called "Nightly" and doesn't even include any Firefox branding. Still, it does work, and it already has enough features to give a good taste of what's in store for Firefox on Windows 8. Users who want to try out the Windows Store version – tsk, Mozilla is still calling it a "Metro" app – need to be running the RTM (Released to Manufacture) version of Windows 8 or later. Earlier versions of Windows, including the Windows 8 preview releases, only get the desktop version. The overall look and feel of the new browser is based on Mozilla's new "Australis" UI concept, a curvy, pastel-hued theme that Mozilla developers describe as "streamlined, modern, and beautiful" (if they do say so themselves). But the first thing users are likely to notice when they launch Firefox from the Start Screen is its start page, which has been redesigned to fit better with Microsoft's Windows 8 design language. Pages from the user's bookmarks and browsing history are represented as blocky, colored tiles, much like how applications are displayed in the Start Screen itself. The new start screen of the Windows Store version of Firefox. Look familiar? According to a blog post by Mozilla's Brian Bondy, however, the new Firefox's support for Windows 8 runs much more than skin deep. It supports standard Windows 8 touch and swipe gestures, includes an "App Bar" menu for commonly used functions, integrates with Charms, and it supports the Share Data Contract to allow users to pass web pages to other Windows Store apps. One thing the Windows Store version doesn't have yet is Flash support, although Mozilla says it's working on it. It also can't use add-ons – that's right, no AdBlock for now – but Bondy says Mozilla does eventually plan to support them via an SDK (software development kit). Mozilla hasn't set a date for when it will ship a stable release version of Firefox with all the Windows 8 features enabled, although Bondy says it's "mid development for a beta version." Nightly updates are enabled, so users who try it out now will get to follow its progress as new fixes and features are added. As with all Mozilla previews, both bug reports and feature requests are accepted.